Added 4 pages with ‘C64 service information’ with thanks to Ove Mejlgaard. Papers contain information regarding VIC 6569 noise fix, RESTORE key sensitivity fix, fixing video interference on motherboard rev. 250425 and a keyboard schematic. 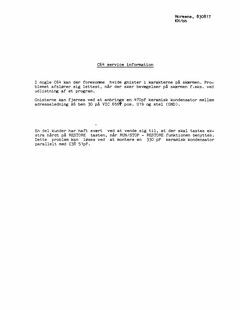 This entry was posted in C64 Hardware and tagged c64, danish, service manual by Martin Sørensen. Bookmark the permalink.